The Mazda MX-5 has been named UK Car of the Year 2016, ahead of the Volvo XC90 and Skoda Superb Estate. Mazda’s brilliant fourth generation roadster triumphed in the Best Open Top Car category before being considered for the overall award. John Challen, Director of the UK Car of the Year Awards, hailed the latest MX-5 as “the perfect roadster”. “It’s a lightweight engaging, simplistic and even practical vehicle, which is an absolute pleasure to drive,” he added. Behind the scenes of UK Car of the Year: what goes into deciding Britain’s best car? For Nat Barnes from the Express, the new MX-5 was “the best car I drove in 2015”, while Car Magazine’s Tim Pollard described it as “a fabulously polished and democratic sports car”. The new MX-5 was also named Best Convertible in our ContractHireAndLeasing.com Car of the Year Awards earlier this year, before losing out to the Audi A4 for the overall Car of the Year honour. It could still go on to clinch the World Car of the Year title too, after being named as one of three finalists at the World Car Awards. We’ll find out if it triumphs when the winners are announced at the NY Auto Show on 24 March. 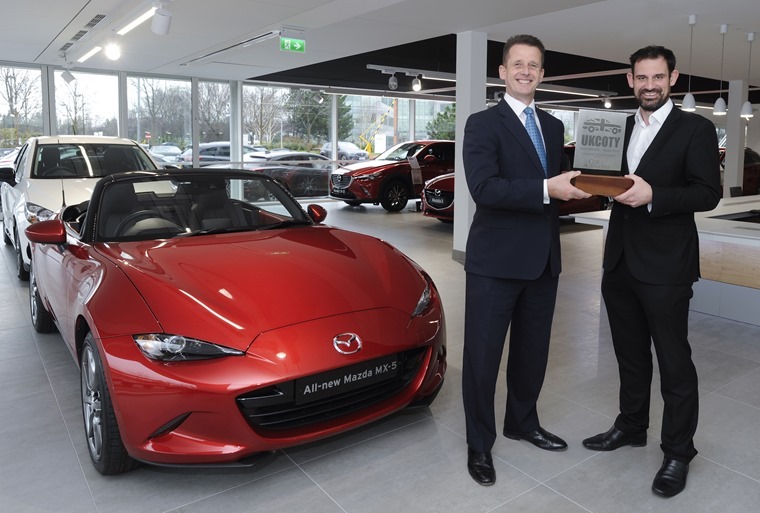 Jeremy Thomson, MD of Mazda UK, was delighted that the MX-5 had picked up yet another award. “The MX-5 embodies all that is great about our products. Its fun to drive character has earned it a place in the hearts of driving enthusiasts the world over,” he said. The Volvo XC90 came second after winning the SUV award, while Skoda’s Superb Estate finished third. The rest of the rundown continues below. The UK Car of the Year Awards were first launched in 2014 and this year marks the first time that a BMW model hasn’t claimed the top prize after the i3 and i8 won out for the two previous years.